Over 70% of the world’s energy will still be supplied by fossil fuels in 2030 and a US-style shale gas revolution is unlikely to “go global” any time soon and so replace coal, BHP Billiton (ASX, NYSE:BHP) chief executive, Andrew Mackenzie, said Tuesday. Speaking to energy executives at CERAWeek conference in Houston, US, the head of the world’s No.1 mining company added coal would remain the main source of affordable energy for the fastest-growing Asian economies. As 1.7 billion people gain access to electricity for the first time over the next 20 years, Mackenzie sees global energy demand increasing by over 30%, driven largely by China and India, but experiencing the speediest growth in Africa. 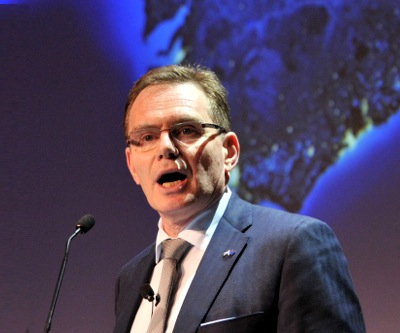 BHP’s leader said he believed sustainable energy security for the planet and its people was achievable, since renewables would provide a growing source of energy. “But genuine reliance on them would depend on the development of large-scale and cost-effective energy storage. Fossil fuels would remain central to the energy mix given their affordability and the scale of existing infrastructure,” he said in his speech. In a move likely to cost him a few friends, Mackenzie called the resources industry to control its carbon emissions, given that more than 70% of energy would be supplied by oil, gas and coal in about 15 years. “The solutions we choose must address energy poverty and climate change together. Any attempt to solve one without the other is destined to fail,” he said. BHP has gas production in the US and Australia, but also mines coal, uranium and copper, which are all commodities used in power generation.